Shooting Review – The H&K VP9SK | Eagle Gun Range Inc.
Heckler & Koch’s VP9 remains one of the more popular full-sized pistols of the past few years. I remember when shooters first got it into their hands, they immediately started calling for a compact model for concealed carry. Now, after a few years, H&K have release that smaller-version pistol. 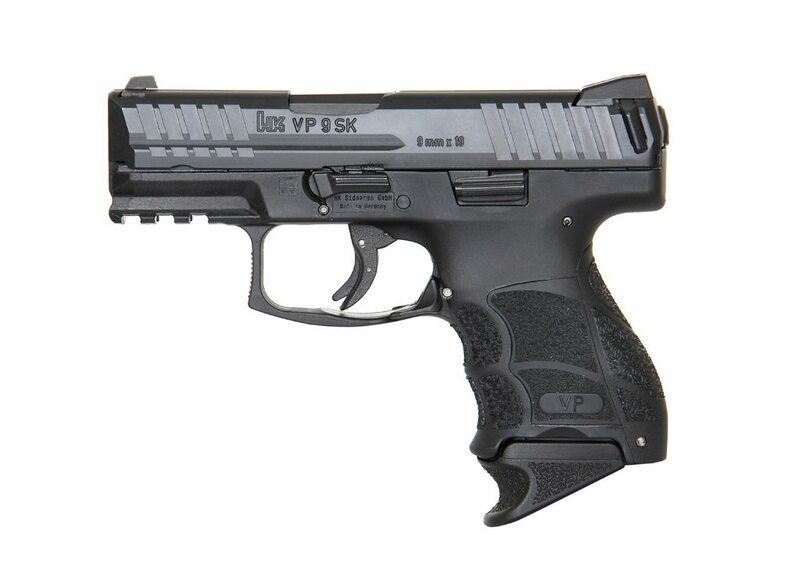 The VP9SK (SK for subkompakt, I think) is an abbreviated version of the VP9. I have been shooting the VP9SK this month and have some thoughts to share on that experience here. I was pleased to find that it does bring with it that butter-smooth trigger and the contoured, configurable grip. It also brings with it some of the less attractive features of the larger model, but not all of them. Here are my thoughts after spending a few hundred rounds with this oddly-large subcompact. Why Consider the H&K VP9SK? The H&K VP9SK is a large-ish “subcompact,” double-stack pistol that is purpose-made for concealed carry and it has many of the qualities of its larger namesake. You might consider this pistol for the manufacturer’s reputation for producing firearms of excellent quality. You might also consider this one if you don’t want to carry a full-size pistol, but don’t want the lower capacity of a single-stack gun. Mostly though, you might consider this pistol if you really enjoy the popular features of the VP9 and wished there was a smaller version for concealed carry. There is! The overall size and weight of this supposed subcompact pistol are a bit surprising. While slightly smaller than a compact Glock 19 and with considerably less capacity, the VP9SK is a couple of ounces heavier! That’s not what I would have expected from a gun that is labeled a subcompact. The fact of the matter is that despite the claim, the SK is not a subcompact and is among the larger and heavier compact pistols on the market. This may or may not matter to some individuals, but it’s worth noting for comparison purposes. Putting rounds on target with the VP9SK was, for me, a better experience than shooting its full-size brother. The shorter slide of the SK greatly reduces the muzzle flip found with the full-sized VP9. 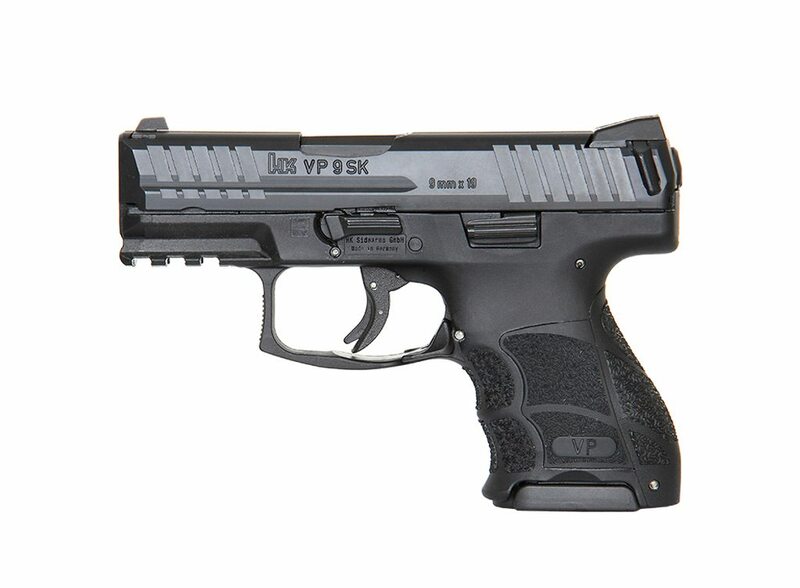 In that respect, the VP9SK provides a superior shooting experience. Not surprisingly, the trigger on this compact model is as good as on the full-sized original; smooth and relatively light. I, like many others, think this is one of the better stock triggers available on a striker-fired pistol. What I first noticed when I started shooting the SK was that my hands could not find a comfortable position for a good grip. I felt awkward holding the pistol, due to the extended mag finger-groove mismatch for my primary hand and the lack of any anchor point for my support-hand thumb. Others with different-sized hands and grip conventions may or may not have this experience. The only other things I found less than enjoyable on this pistol were the paddle-style magazine release and the polymer “wings” on the back of the slide. More on those later. The extra weight this medium-sized gun carries makes for a relatively soft shooting experience. 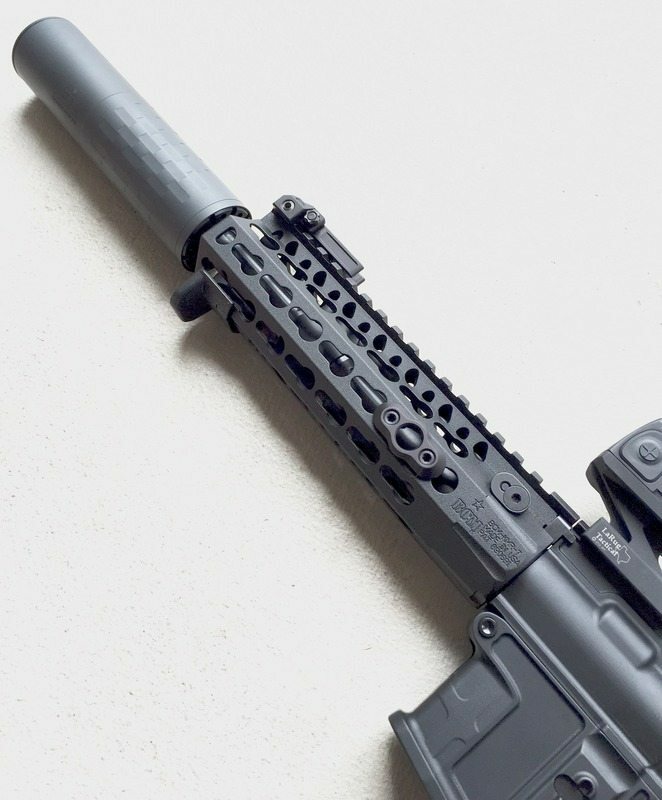 I find its recoil impulse to be less noticeable than that of the G26 or other double-stack short guns. The fact that the VP9SK is considerably larger than most of these certainly helps on that score. Controlling the VP9SK is easy. With its relatively soft recoil impulse and lack of muzzle flip, fast follow-up shots are a breeze. It would be even more controllable if there was an index point for your support-hand thumb on the forward frame. The takedown lever is there, but it is too far back to be a worthy anchor point for anyone with large or medium-sized hands. As I mentioned earlier, I did not find the SK to be a comfortable gun to hold or fire. I like the finger grooves in the grip, but the added groove that comes on the magazine extension does not play well with the rest of the grip. I ended up with either odd finger placement or my pinky on the hump of where the grip and extension meet. And for reasons already mentioned, my support hand always felt oddly weak on the gun. Shooting was not a comfortable experience for me. The SK’s 10-round capacity is fine for a double-stack subcompact, but given the fact that with the extended magazine the grip is larger than even the 15-round-capacity Glock 19, there should have been room for a couple more rounds here. This is not a tiny gun and it flat out dwarfs the 10-round Glock 26. So it’s not bad capacity, just a little disappointing based on the size. That said, there are 12-round extended magazines available from H&K. At around $70 each, they’re not an easy purchase to contemplate. Not surprisingly, the slide is nicely contoured and finished, and has excellent serrations front and rear that provide excellent purchase for manipulations. A conspicuous feature on the slide is the presence of polymer “wings” at the back. I assume they’re meant to assist a weaker operator in racking the slide, but I found them to be quite uncomfortable when doing so. Moreover, they’re entirely unnecessary since the slide serrations are well done and easily gripped. I’m told you can remove these wings and I’d highly recommend doing so. Again, the trigger is excellent and it doesn’t ask to be modified in any way. There is a trigger-shoe safety rib that, unlike with some other models, doesn’t create any discomfort when pressing the trigger a couple hundred times in a shooting session. Well done. The grip has a conspicuous hump in the backstrap, but I found it fit my hand quite nicely. Like the VP9, the SK model comes with replaceable side and rear grip panels that allow you to find the perfect combination of contour and size. This is a good feature more guns should have. The paddle controls are not easy to reach with either my thumb or index finger so I have to modify my grip considerably to actuate it. I ended up using my index finger, as it was the easiest to use and required the least grip modification. Others with different sized hands may not have this trouble. The frame includes a picatinny rail for lights or lasers and I found the drift-adjustable 3-dot sights to be just fine. Like the magazine release, the slide-lock lever can be accessed on both left and right sides. While the SK comes with a flush and extended magazine, the extended mag does not add any capacity. C’mon, H&K, stop being stingy! The VP9SK is relatively soft shooting for a subcompact. The trigger is excellent and the stock sights are good (they’re glow-in-the-dark, but not “night sights”), combining to make this a small pistol that’s easy to be accurate with. The configurable grip panels allow you to find just the right grip size and contour for your preference. Some folks will like the ambi slide-lock lever. The VP9SK is heavier than the G19 even though it is smaller and has considerably less capacity. Some folks may find that the VP9SK doesn’t conceal as well as other subcompacts, due to the wide slide and heavier weight. The finger grooves don’t match well with the magazine extension. The magazine extension doesn’t afford any extra rounds. There is no forward anchor point for the support-hand thumb. Some people will not like the paddle-style magazine release and the slide “wings” just get in the way. Finally, it’s a bit pricey. The VP9SK was not for me very ergonomic. The grip was excellent (and configurable), but I was never comfortable holding and shooting the gun, owing to the mag-extension finger affordance and no good place for my support-hand thumb. Additionally, the magazine release controls were not easy for me to manipulate. I admit I was a bit disappointed on this score. Definitely a shootable pistol in other respects; has a great trigger, it’s easy to get quick follow-up shots, and it’s not too snappy. I found it to be plenty accurate for a small gun. At 1.31” wide, the VP9SK is rather chunky—even for a double stack—and with the magazine extension the grip is a long as that of a G19. So it’s not unconcealable, but for a supposed subcompact it will be a bit more difficult to conceal. I simply found too many nitpicks to really enjoy this pistol. That said, lots of folks love the VP9 so I expect they’ll enjoy this smaller version too. Moreover, Heckler & Koch are known for the excellent quality of their guns and I found nothing here to cast doubt on that quality. If you like chunky, heavy, small guns of excellent quality with moderate capacity that afford right-hand or left-hand manipulations, The VP9SK is definitely worth checking out. As a model to bring something new and special to the compact/subcompact market, this is nothing to write home about. Even so, I encourage you to rent this pistol and see what YOU think of it. HK is legendary for their ergonomics! Your literally the only review I’ve seen on the entire internet that said they are bad. You keep comparing VP9 to Glock 19’s.. get a clue and stop reviewing guns on the internet, stick to road cycling. I have the VP9SK and HK45. I have medium to large hands and find the ergonomics to be better than most guns on the market. Glocks are awesome but can not in anyway compare with the ergonomics of the HK. The SK has many combinations for grip configuration to suit large medium and small hands. Your review does not make sense. I also have the full size HK45, P30 and VP9SK, they have the best ergonomics of all guns i own. I own Sigs, Beretta’s as well as revolvers and I still give the edge to HK. You can customize grips to fit any hand size, as said above your review does not make much sense. You seem to be biased towards Glock and not giving HK much of a chance. Eveybody should know that one mans opinion does not make or break a pistol. Do your own testing and create your own thoughts. This handgun, in my opinion, is incredible. Every knock from above here, is simply not accurate from my experience. This is a truly great weapon and a true joy to shoot. Do your own homework and formulate your opinion after a few rounds of testing. You’ll certainly appreciate this HK after you do. I agree with the previous commenters. This pistol may not be for everyone. It works for me because I shoot it better than other pistols. I’ve had my VP9SK for a few months, put almost 2600 rounds through her so far. And as far as concealability, carrying my SK AIWB in a Vedder LightTuck holster, along with one of the Vedder IWB mag holders carrying a 15 round mag, this setup is very concealable, almost as good as my Glock 26 rig, using another AIWB LightTuck holster and IWB mag. I love my VP9SK! It has easily replaced my gen4 26 as my concealed weapon of choice. Before my wife and I chose a gun for her first conceal carry we researched the hell out of almost gun out there. Rented many of them too. Because of left handed and small hands the VP9SK was our choice and we have been very pleased with all aspects. Love shooting it as it’s very accurate. Only problem with it is we keep fighting over it so I got a full size VP9. You were incorrect when you wrote that the HK VP9SK is heavier than the Glock 19. The VP9SK is a little over a half ounce lighter. This is your main ‘con’, and it’s incorrect. Glock 19 with empty mag is 20.99 oz (21 oz). The VP9SK is 10% heavier. Maybe was referring to both being loaded? Interesting comments on the width vs. the G19. I watched Hickok45 put his calipers on this and the Glock 19. The overall width at the frame, including controls, was damn near identical. Also, no mention of the interchangeable backstraps and side grip panels? Unless you have alien hands, there is a very high probability that you can make it fit your hand pretty well. I have a VP9 and VP9SK. The SK is my daily carry. I for one don’t get along with Glocks. I’ve never enjoyed the trigger or grip. I’ve owned a couple and spent $ on upgrades which still didn’t get them to the comfort and accuracy I have with my VP9s. I do wish it carried more rounds in a single clip. To me, that’s the only downside besides being a bit more difficult to find accessories. Andy you really dont get it !! This weapon puts Glocks to shame. I had a19 26 and 43 got rid of all of them. This VP puts them to shame. Ilove mine.